There are so many captivating saree blouse patterns, each unique for different kinds of sarees. 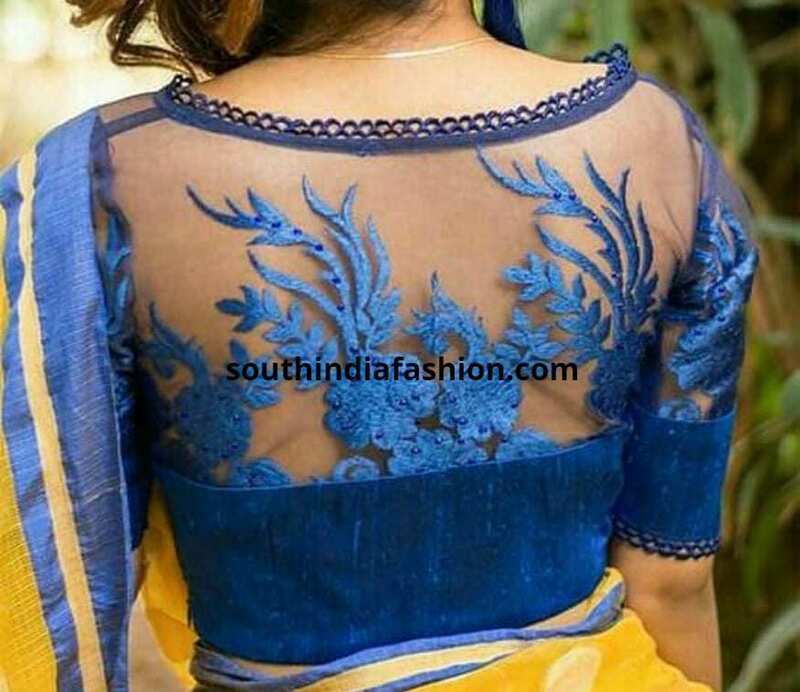 From the whole set of these blouse designs we bring to you 30 exciting saree blouse patterns that you can wear with silk sarees, designer sarees or even fusion sarees. Check out the list for more inspiration on it. Now that striped sarees are back in vogue, this blouse is a great option to pair it with. 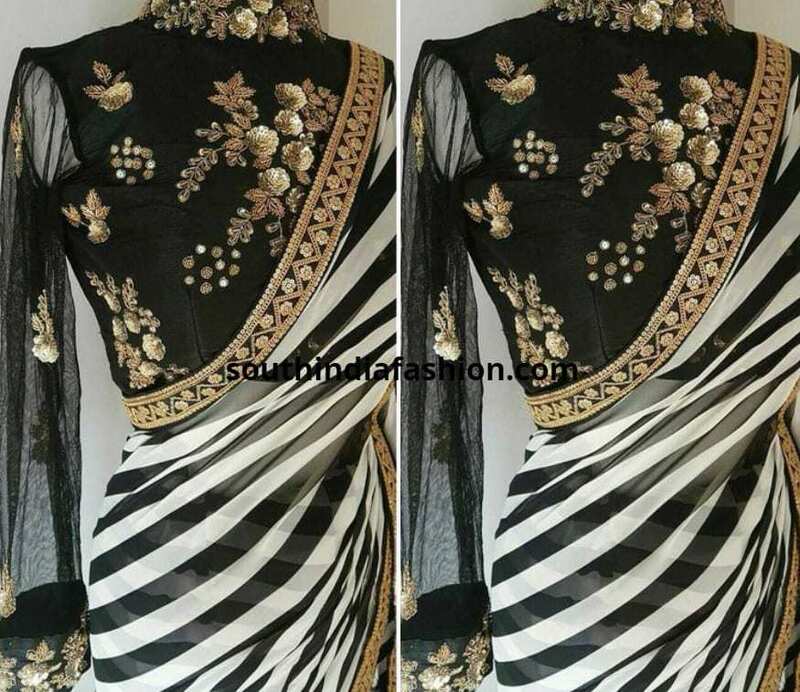 The high neck blouse with zardosi work and transparent full sleeves works very well with this striped saree. 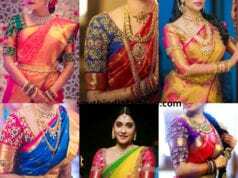 Choose a blouse in one of the saree colors for best effect. Ruffled blouses are a big thing now. Depending on the kind of saree you can add the ruffle. So what kind of ruffled blouses work for fun print cotton sarees or plain sarees? Nothing but this elaborate tiered ruffle blouse will do justice. 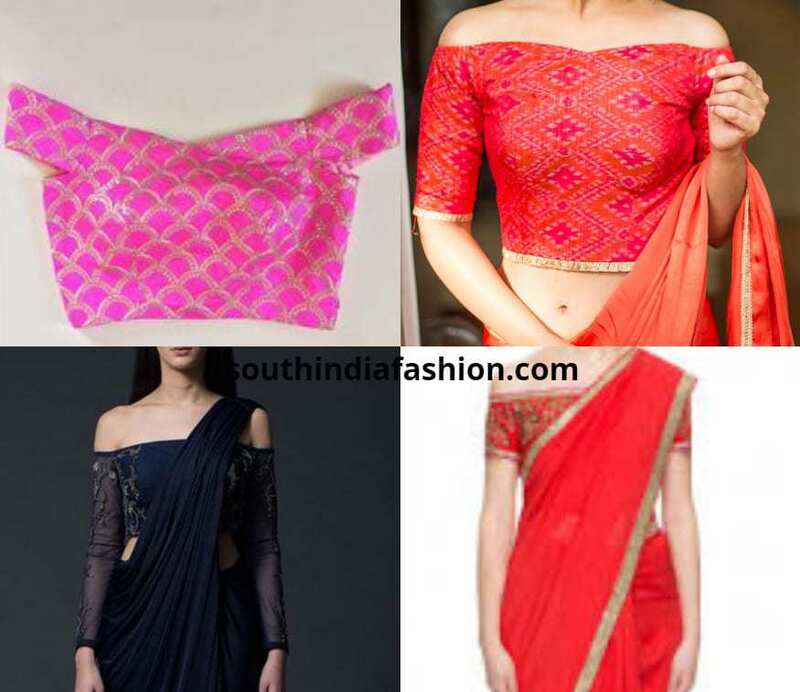 So what kind of ruffled blouses do you wear with pattu sarees? Check out this beautiful blouse on Anupama Parameshwaran where the ruffle is so delicate that it looks very elegant and classy. 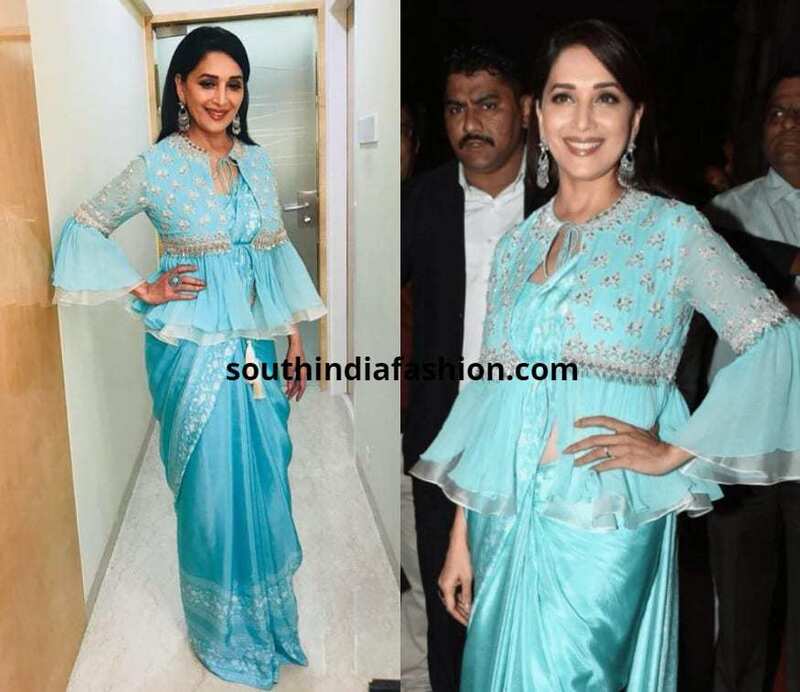 This is one of the saree blouse patterns that has held its ground since the last 2 years and for sure is not going to disappear. 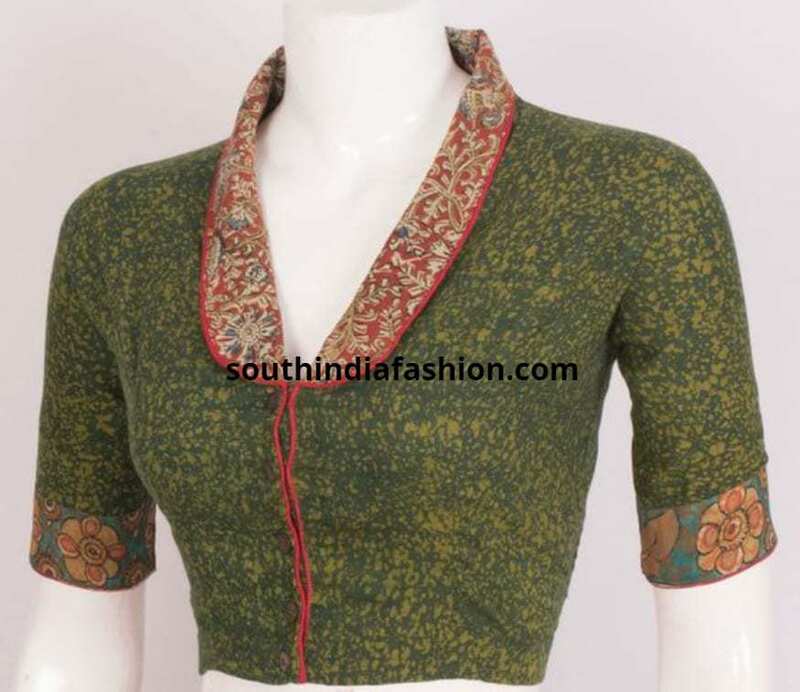 Boat neck blouses are a must have, in solids and if you are pairing it with pattu sarees or any handloom saree this brocade blouse will add more depth to the look. Shop readymade brocade blouses online HERE! Apart from the solid boat neck blouses, you need some fun blouse designs too with boat neck that you can pair with your fancy sarees. With boat neck blouses feel free to go with full sleeves, elbow length or sleeveless. All looks fab!! 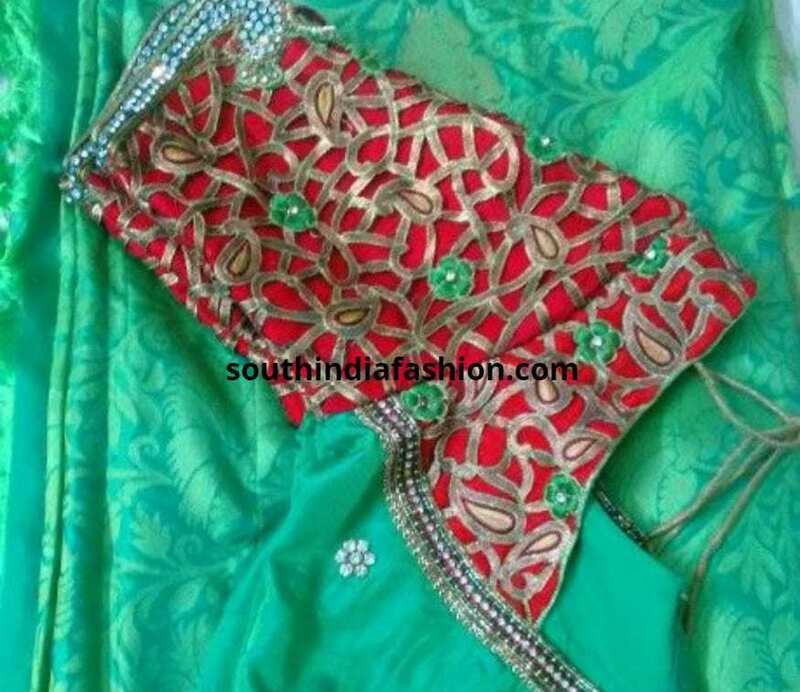 In the last couple of years fusion sarees have become main stream. That is how shirt style blouse designs have gained so much popularity. Samantha Akkineni rocks a solid shirt style blouse with a simple saree. She also adds a belt and this look can take you anywhere from morning to evening. How about a jacket style blouse? There are so many kinds of jackets you could add. Go for a peplum style jacket blouse or a fitted smart jacket with a simple saree. Remember when you add on a jacket, let the jacket do the drama or the saree for the look to be complete and not over the top. 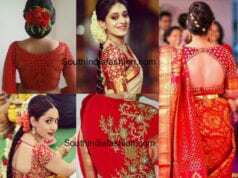 Off shoulder saree blouse patterns is very popular with the crowd now. 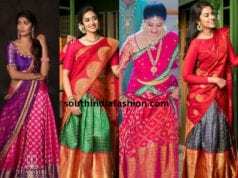 Have a few of them in solids, ones with tassels or in simple brocade to carry it off with georgette sarees, pattu sarees. Cold shoulder saree blouses are trending. Try them in silk with pattu sarees or in heavy work with your fancy sarees. You can opt for short sleeves or elbow length sleeves with this one. When you wear a plain saree and pair it with a plain blouse, add some much needed drama with a cape or even better a cape blouse. Cape blouses have taken the fashion world by storm and are here to stay. Lace blouses are so vintage. Choose some sheer magic which has lace to make the blouse look magical. You can pair lace blouses with lace sarees, plain sarees, or any soft flowy saree. Sheer blouses with button detailing is another of those blouse designs that you can pair with all kinds of sarees. Due to the addition of the buttons and the sheer detailing solids look better than printed counterparts. For all you experimental ones this criss cross blouse is a must have. You can pair this with almost all kinds of sarees and notice the heavy work and the padding. For these kind of blouses it is advised to add padding to avoid a fashion faux pas. This is a gorgeous backless blouse with embellishments that does justice to all your fancy sarees making it way more interesting. The draw strings can be of contrast colors, bling to add more drama. 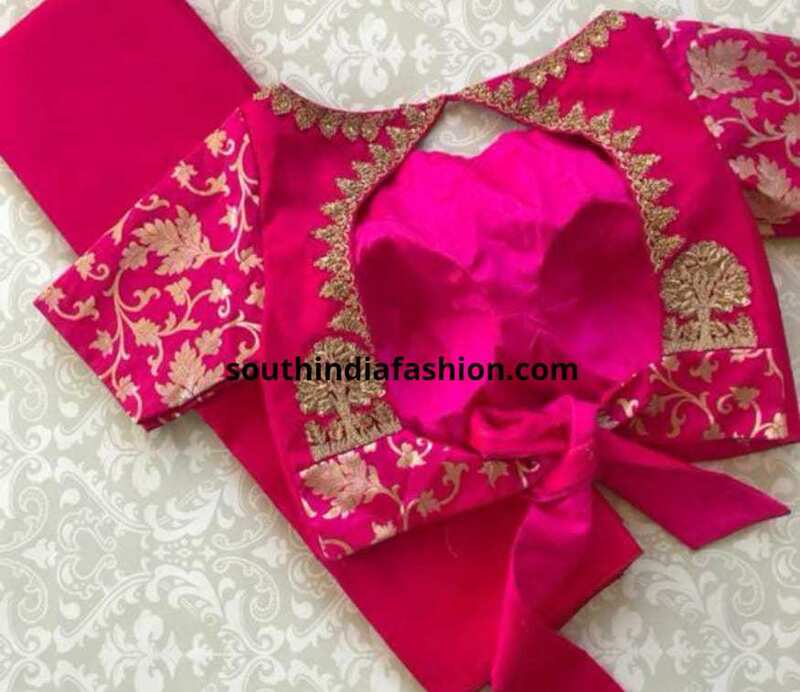 One of the perfect blouse designs best suited for pattu sarees or any traditional drape, the exaggerated puff sleeve with the additional border. Keeping the rest of the blouse simple gives the sleeves the much needed emphasis. 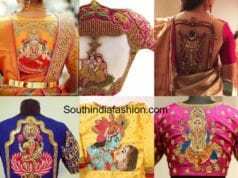 To add some quirk to your pattu saree blouses go for the famous monument blouses or the Taj Mahal blouses. You can choose them in brocade, can get them embroidered. They go very well even with fancy sarees. High neck saree blouse patterns are a mandate now. Channel the vintage look with a heavy maggam work high neck blouse with Kanjeevaram sarees for a beautiful look. Another high neck blouse, but with a zipper and a sleeveless design. This is just the blouse for your fancy sarees. If you like this pattern, you can replicate it in saree colors for your Kanjeevaram sarees too. They look superb! This bow back blouse is something that is a little more secure than the thin ties or loops and instead of the actual bow you can create one and make it look like a bow with now tie up required. 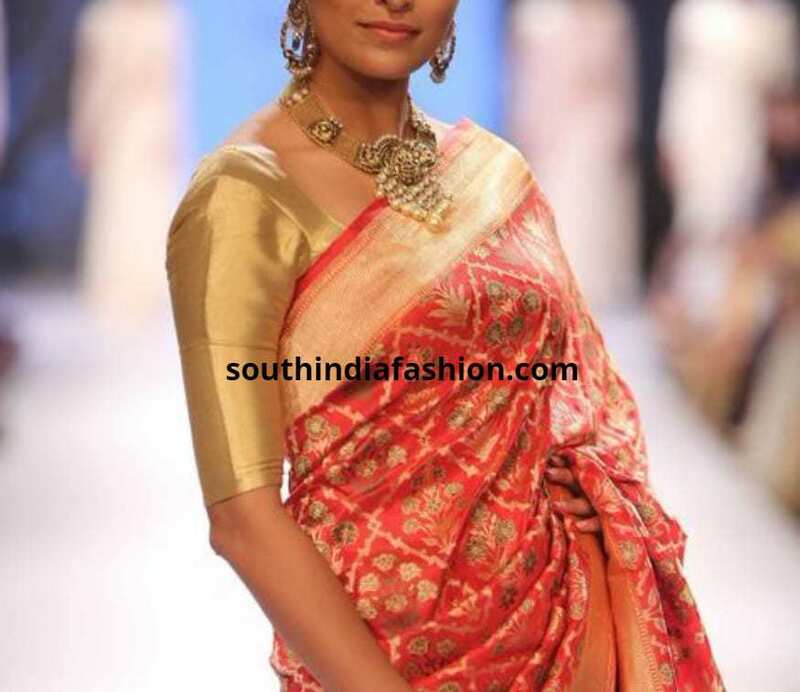 In traditional colors and tones this looks lovely with silk sarees too. What a brilliant bridal blouse is this? 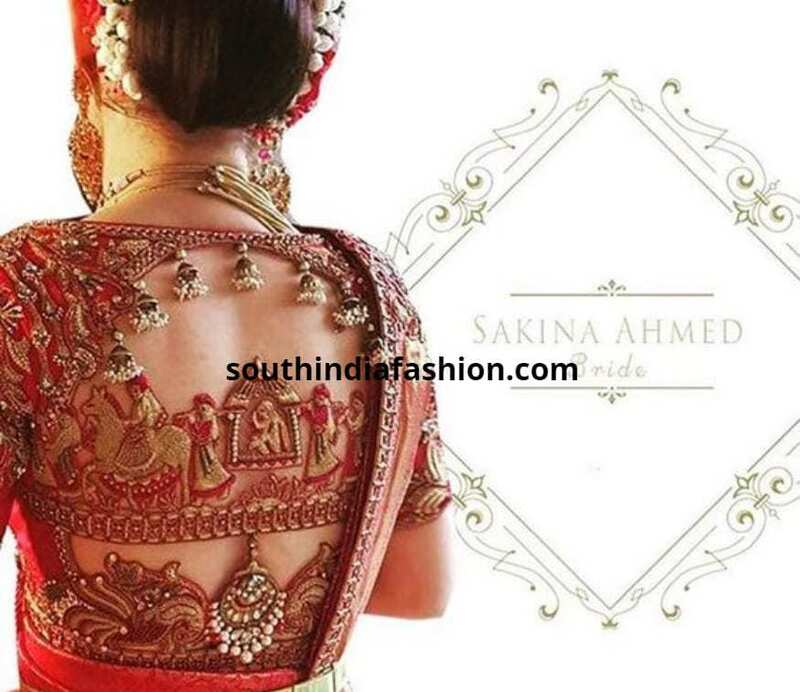 Check out the barat scene that has been done by talented Sakina Ahmed is a must have for every bride. 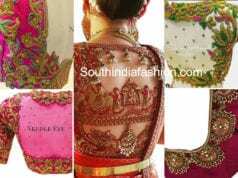 It works for pattu sarees, lehengas or anything bridal. The basic black shimmery blouse that can be paired with almost everything is obviously a must have. 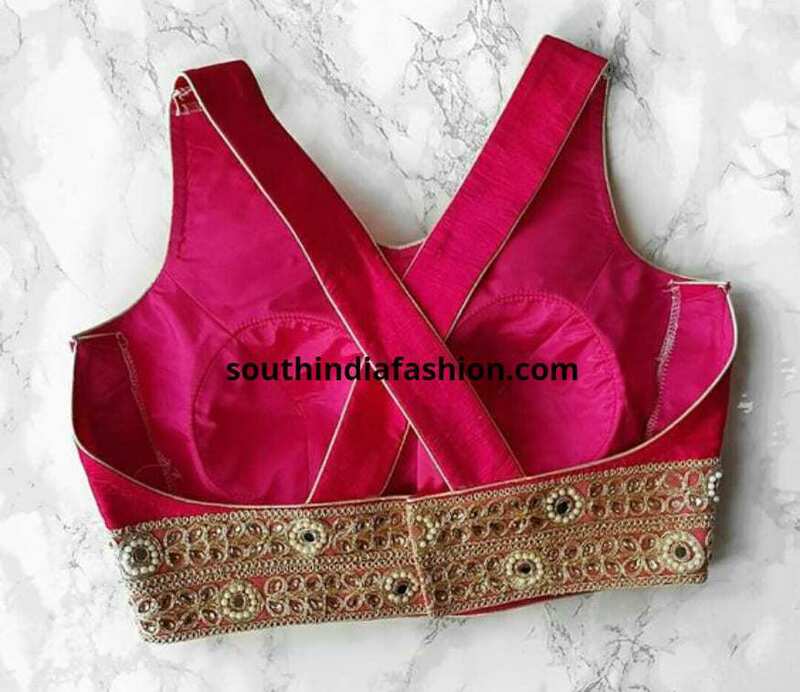 It can be a savior blouse for times that you do not have the right blouse for your saree. We love Anita Hassanandani’s blouses. Each and every one of her blouse designs are epic and this wrap halter cross is no less. This beautiful blouse is for the funky girls out there. When we said striped sarees are in vogue, we should also tell you so are striped blouses. These blouses go with almost everything. In fact they make your sheer sarees look way elegant. Another backless blouse to add to your collection should be this one. The bling, the pattern is just right and it is a dream choice to pair it with simple sarees and make this gorgeous blouse stand out. A basic solid full sleeve blouse is what elegant days are made of. Have a few done up in basic colors or colors that dominate your wardrobe. A bling gold blouse covered with sequins and most important, a sleeveless option is so needed for all kinds of sarees. 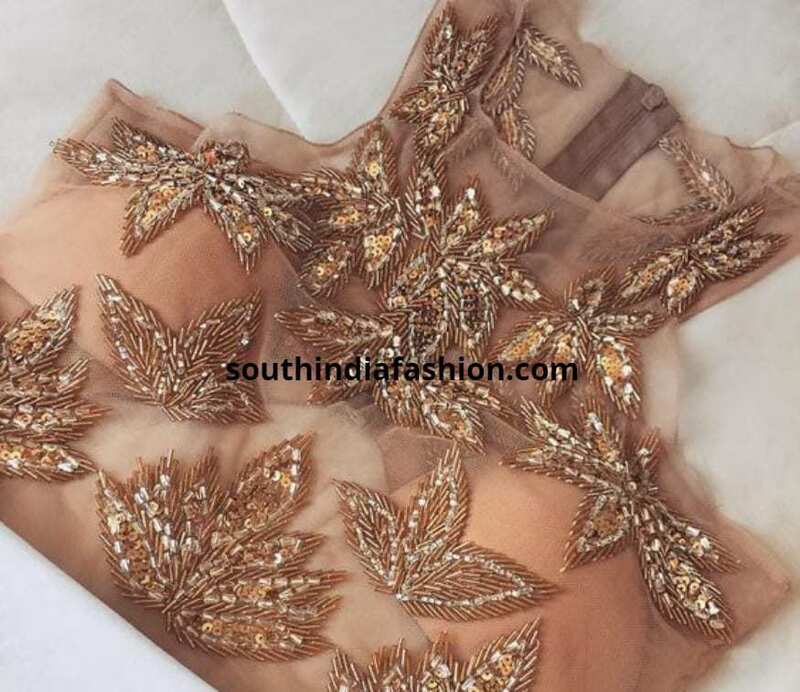 You can brighten up a plain saree with this sequins gold blouse. For those who are not up to the sleeveless game, invest in a good gold blouse that will be your savior in many occasions. For all the office goers and the cotton saree lovers this collar neck blouse with the delicate border adorning the collar and sleeves adding the pop of color, you should try these out. Cut work blouses and Kanjeevaram sarees are a match made in heaven. 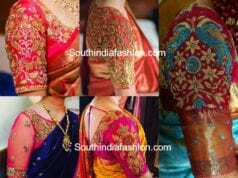 Perfect as bridal blouses or a blouse for any heavy saree, you will love these cut work saree blouse patterns. Adding some sheer drama is always wow. This is a crop top style blouse with sheer detailing on the strappy edges to make it look more glam. Pair this up with a not so heavy saree to make the blouse shine. This blouse in colors like black is a great addition to your wardrobe. So ladies hope you know which blouse designs in your wardrobe is going to help you rule the fashion front this year! !